You can help continue the work of Sacred Heart education begun by St. Philippine Duchesne so many years ago. The following information is offered to assist you and your tax adviser. Online Giving is a quick, easy way to make a contribution. Cash is still the most popular way to make charitable gifts and most gratefully received. Box Tops for Education General Mills Box Tops for Education offers two ways for families to earn money for their school. The first is the one we are most familiar with – clipping the Box Tops coupons from the tops of hundreds of participating products. Since 2002, the school has earned approximately $12,000. Wow! What an easy way to support ASH! The second avenue to earning is to shop at more than 60 stores through the online Box Tops Marketplace. Stores such as Wal-Mart, Pottery Barn, Kohl’s, Nordstrom, Old Navy, Office Depot, Harry & David, Cabela’s and many more donate from 1% to 7.5% of qualifying purchases back to the Academy. Check it out for yourselves at www.boxtops4education.com. This website is filled with other goodies, too— recipes, coupons and more. Schnucks eScrip Since 2006 the Academy has participated in the Schnucks Markets eScrip Program. Many of you have taken advantage of this offer to support our school and, since that time, the Academy has earned nearly $18,000 from this program. Each time you swipe your card, the Academy receives 1% of the amount you spend. As our total increases, so does the percentage of return. If you have misplaced your card or would like a second one for your household, please pick up another Schnucks eScrip Community Card at your nearest Schnucks store or contact the Advancement Office at 636-946-5632. Your new card may be activated by calling 1-800-931-6258 or via their website. Let them know that you are supporting the Academy of the Sacred Heart (ID# 6466845). 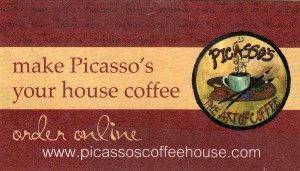 Picasso’s will donate $2 to the school for each 12-oz. bag of ASH Blend sold. Stop by Picasso’s at 101 North Main Street to give it a try. ASH Blend is also available for purchase online. Stock Gifts are one of the most advantageous ways to give. Gifts of appreciated securities can result in significant tax benefits. Stock can be transferred directly to our account at Stifel, Nicolaus & Company, Inc. (no actual certificate is required). If you already have the stock certificate, it may be delivered to the Academy Business Office for transfer. Our legal name is: Religious of the Sacred Heart and Academy of the Sacred Heart of St. Charles, State of Missouri. Our Federal Tax ID number is 43-0662494.